Scurrying across the moss covered tree trunk, the little rascal had done it again. There he was sitting out in the open just waiting for Copper...taunting him. Come on you old four legged has been. Come and get me! Oops! I didn't think he heard me!! and went around the corner to rest. Here's the one I worry about. Did I tell you that we, American Red Squirrels...also known as pine squirrels...have a nest in the woods? Yep. There's a bunch of us...a whole village. And believe me when I tell you we defend our territory!! We'll drive these two dogs crazy all summer...LOL! Love that collage....the colurs are fabulous. Oh, he IS adorable! But I bet he is a little pest, too! I LOVE seeing your red squirrels. They are the cutest little things. Some of that family has made it to our backyard and I always know when a 'red' is around from the chatter they make. They do like to taunt the dogs! Love it - have they ever caught one? What is that little blue house under the tree? 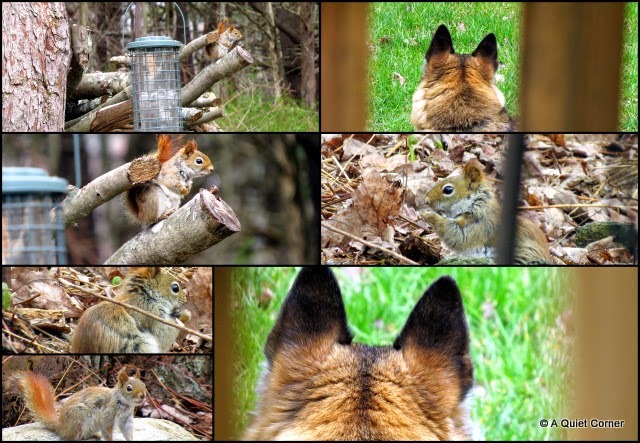 We do not have a single red squirrel around here! At least I have never seen one. We have lots and lots of greys though I think the reds are so much prettier, especially their ears. Your dog's ears are adorable! And great shots of the squirrel too. How wonderful to have red squirrels sharing your space. Those pictures are fabulous as are the colours. Those are amazing photos. What a little charmer your squirrel is. So's Copper, of course! Copper and Moon will be busy outdoors keeping this pesky fellow at bay. We only have grey squirrels around our yard and they are just as annoying. That squirrel is so cute! 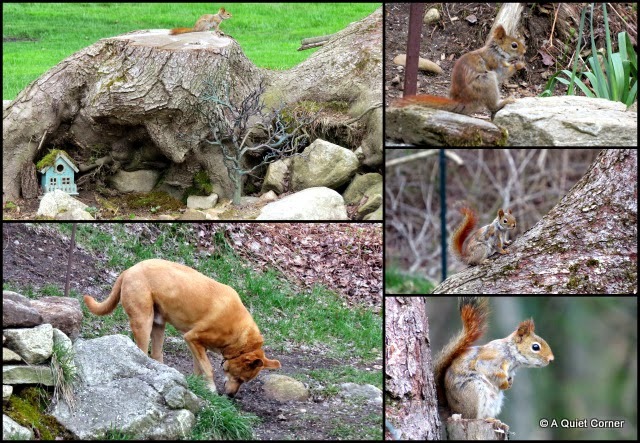 Nice captures and cute interaction between the squirrels and dog.